December 13, 2016 - New Yorker Electronics is now distributing the brand new Exxelia Magnetics (ex-Microspire) TCM Series of Common Mode Chokes. The series, just unveiled last month in Munich at Electronica, is designed and qualified to be compatible with aerospace applications and is a cost-effective solution for harsh environments. 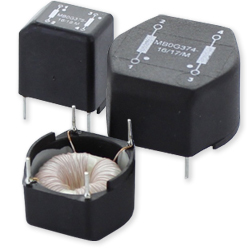 TCM common-mode chokes are offered with inductances from 0.7mH to 47mH under rated currents from 0.3A to 4A, and thoroughly tested by a dielectric withstanding strength at 1,500VAC. Their excellent thermal properties allow the TCMs to operate without a hitch from -55°C up to 125°C which, combined with the high mechanical resistance of the component materials, make those products useful for aviation, defense and transportation industries. TCM series can be designed into circuit boards on a large number of power electronic devices used for a wide range of applications, including switch mode power supplies and converters, inverters, battery management systems and chargers. The TCM series is available in a through-hole package for horizontal and vertical mounting. All materials meet UL94 V0 ratings and the devices fully comply with the requirements of RoHS and REACH. New Yorker Electronics is franchise distributor of Exxelia Magnetics (ex-Microspire), part of Exxelia Group, and supplies its full line of Film, Mica, Tantalum, Aluminum Electrolytics and Ceramic Capacitors as well as its EMI/RFI Filters, Magnetics, Position Sensors, Slip Rings and Rotary Joints.